1) On average a water heater should last approximately 10 years. 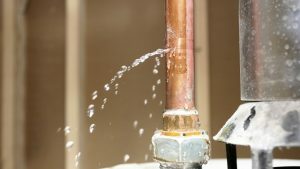 As the water heater approaches its life expectancy, maintenance and inspection may need to increase as the parts become used and worn setting the stage for a sudden burst or slow leak. At a minimum, have your water heater inspected annually. 2) Be sure to check for moisture surrounding the plumbing connections and look for pools of water under or on top of the tank. Carefully inspect the piping and shut off valve since patches of rust or signs of breakage can signal more severe damage in the coming days. 3) Check the anode rod. This rod is installed in water heaters to avoid corrosion of the tank and may need to be replaced periodically, so be sure to have it inspected at least every two years while the water heater’s warranty is current and every year after the warranty expires. 4) If you see soggy drywall or the appearance of mold, have a flood/mold specialist perform a moisture inspection to prevent any water damage to the structure. The sooner any water damage can be remedied, the less costly it will be. 5) If possible, consider relocating the water heater to the garage area where water damage to the home can be significantly lessened. A special stand designed for water heaters can also be purchased inexpensively at your local home improvement store. 6) If the worst happens and your water heater suddenly bursts, immediately call a professional with up-to-date extraction pumping systems that can quickly remove water from your home to minimize water damage and mold.